Want to win cash for tuition? Community Future’s Junior Dragons Den is inviting submissions for its fourth annual business pitch competition. 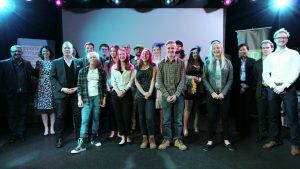 Modelled after CBC’s “The Dragons’ Den,” students in Grades 7 to University will pitch their business idea to a panel of local judges, in front of a live theatre audience, for a chance to win up to $1,500. “To date, business concepts have ranged from diagnostic automotive apps to a line of handmade skin care products,” said Andrea Wilkey, Executive Director of Community Futures Central Kootenay and host of the West Kootenay competition. Students may enter individually or as a team for one of the following categories: Junior (grades 7 to 10), Senior (grades 11 and 12) or Post-Secondary (College / University/ Trades). The first step is to submit a business concept application to the Junior Dragons Den by Feb 28, 2018. A selection committee will review the applications and shortlist candidates for the live pitch competition. The candidates will be matched with a local mentor to further develop their pitch and business plan. Students can elect to enter the West Kootenay Boundary competition April 19th in Castlegar or the North-East BC regional competition, which will be held April 27th in Dawson Creek, BC. The top finalists in each competition will advance to compete in the Provincial Championship, which will be held May 5th at the Charles Bailey theatre in Trail. “With the expansion of the program to North East BC and the future likelihood that there will be a total of four regional qualifiers in 2019, the calibre of competition will truly be on a provincial level,” Wilkey said. To learn more about Junior Dragon’s Den and download an application package, visit juniordragonsden.com.